As dog owners, we found that most stores around us sold sugar filled or preservative, additive and colour ridden ‘treats’. We researched and started selling a small range of natural treats to our grooming and training customers. Over the years, CLEAR Dog Treats has grown exponentially and is one of the biggest natural treat businesses in Australia. We service domestic and international retail and wholesale markets. The CLEAR Dog Treats website was in need of a refresh and update. A lot of the plugins it used were redundant or not working correcting which sometimes affected sales. The aim of this project was to resolve any issues by updating the site but also revamping the site with a new look and feel. Updating gave us the functionality and creative freedom we needed to pull the site into a modern and engaging website, where they’ll be able to better promote products and give users an easier and more efficient way of navigating the site. We kept the branding consistent by using the same colour but incorporated a lot more new imagery of dogs to totally give the website a new aesthetic. 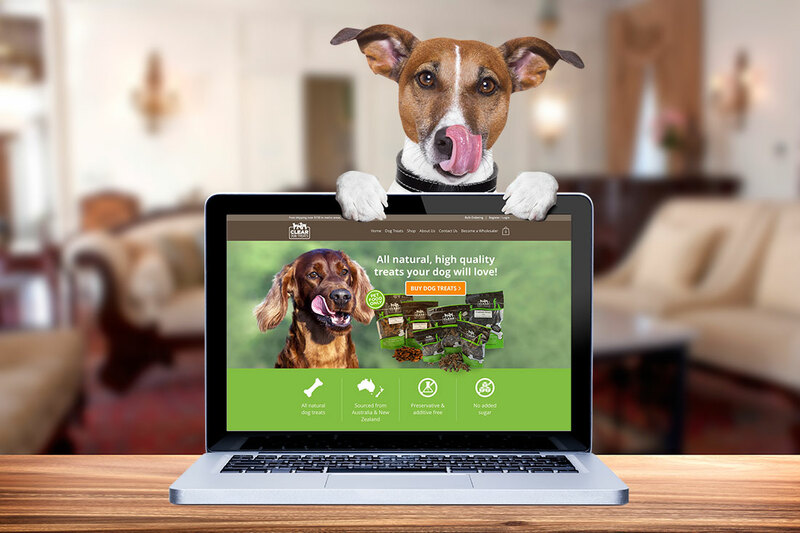 On completion of the project, CLEAR Dog Treats now has a totally revised, restyled and restructured website on a new and more flexible theme base. The revamp also allows for any further enhancements or maintenance as the site continues to grow.